After breakfast, he put on his best Welsh tie, which Mr Prewett and I had bought for him, and we set off on the journey from Cardiff to Newport. Mr Walyaula was surprised that there was not much traffic on the roads but I explained to him that it was because we were so early and that usually the M4 runs very slowly in the mornings! When we arrived at school, we met Mr Prewett who was working hard in his classroom, preparing for the day. He showed Mr Walyaula where the children arrive in the morning and explained that the younger children were brought to school by their parents. Mr Walyaula could not believe that our parents bring their children to school and said that in Uganda, the children always walk themselves, even when they are very young and even though many of them walk more than 3 miles to get to school! Mr Walyaula was also amazed by the projectors and interactive whiteboards we have in each classroom. It was hard for him to understand how they worked, considering that his school doesn’t even have electricity. When all of the children had arrived in school, Mr Rees and I took Mr Walyaula around our Foundation Phase classrooms to meet the children and staff. 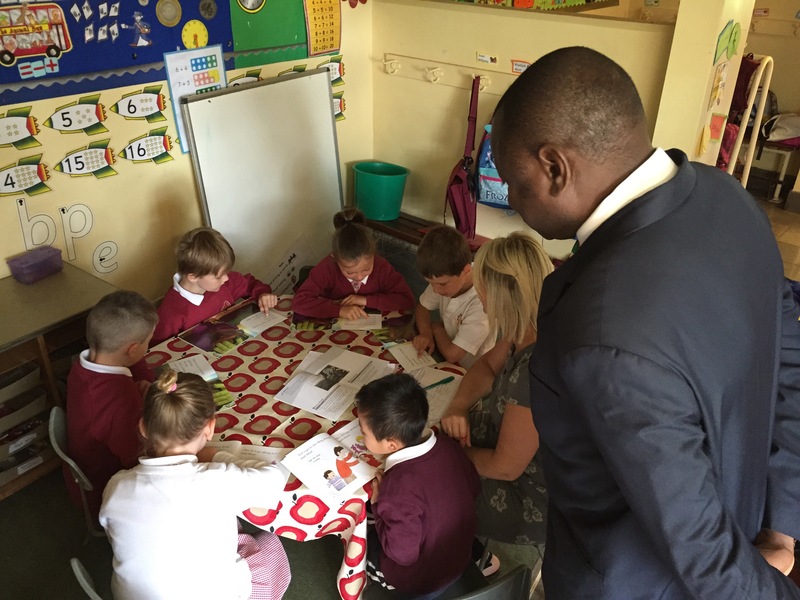 Mr Walyaula really enjoyed speaking to the children and they were all very welcoming to him. He was particularly interested to see our Teaching Assistants working with small groups of pupils. In Uganda, children start school at the age of 6, so he was impressed to see children as young as 3 in our Nursery. At 10:10am, he attended the Foundation Phase assembly and answered lots of the children’s questions about Uganda. There was just enough time for a quick cup of tea before attending the Key Stage 2 assembly. Mr Rees opened the KS2 assembly by questioning the children to see if they could remember some facts about Uganda, from our visit in May. They were able to recite which continent Uganda is in, which countries border it, what the name of its biggest lake is, where the source of the river Nile is, the population, the distance from the UK and the name of its capital city! We were so impressed! I then showed the children a number of pictures and videos from our last trip (available to see in our earlier blog posts), and asked Mr Walyaula to talk about his school. The children were fascinated to hear about the other children. There was silence as Mr Walyaula explained that some children walk barefoot for over 3 miles to get to school and that many of them to not bring lunch as they cannot afford it. A highlight of the assembly was when I showed the children the video of Mr Prewett and I having a ‘dance-off’ in Uganda, although I think they were laughing at us rather than with us! After the presentation, we sang one of our assembly songs to Mr Walyaula and he was really impressed with our singing. He then gave a short speech telling the children how it is important to work hard and not take education for granted. Many of the children wanted to stay and chat to Mr Walyaula after assembly, but we had to shoot off because we had a very important meeting planned! Mr Prewett, Mr Walyaula and two lucky pupils, Reagan and Cory, jumped in my car and the five of us headed off to Cardiff Bay to meet Huw Lewis, the Welsh Minister for Education and Skills. After passing through the tight security at the Senedd building, Mr Lewis met us in the cafe, with his researcher, Charlotte. Mr Walyaula and the children were so happy to meet him and really enjoyed talking to him about Uganda. Mr Lewis was shocked to hear how many pupils Mr Walyaula’s teachers had in their classes and he compared it to the number of pupils he had in his class when he was a Chemistry teacher. The children impressed the minister with their facts and knowledge about Uganda and Mr Prewett and I were able to talk about our recent trip. There was just enough time for a photo with the Minister before he had to leave for another meeting. We were so grateful to him for sparing us the time from his busy schedule, to meet with us. Mr Walyaula was particularly thrilled that he had been able to meet such an influential person in our education system. After our meeting, Charlotte had very kindly arranged for us to have a tour of the Senedd. The guide talked to us about the locally sourced materials that had been used to create the building and how the architect had designed it to be energy efficient. He also took us into the viewing gallery of the main debating chamber and explained to us where the politicians sit and what they talk about. Mr Walyaula was very interested and also taught us about Ugandan politics. After the tour, we had some lunch, a cup of tea, a delicious scone, as well as an ice cream! The children were delighted with all the food they had been given. We then left to make our way back to Newport before the end of the school day. After school, I had a meeting with the new Reception parents, so Mr Prewett took Mr Walyaula over to Caerleon to see the Roman barracks and amphitheatre. He really enjoyed learning so much about the history of Newport. Mr Prewett then took Mr Walyaula back home with him, where he cooked a delicious Sausage casserole. Mr Walyaula keeps telling us how much he enjoys sausages! 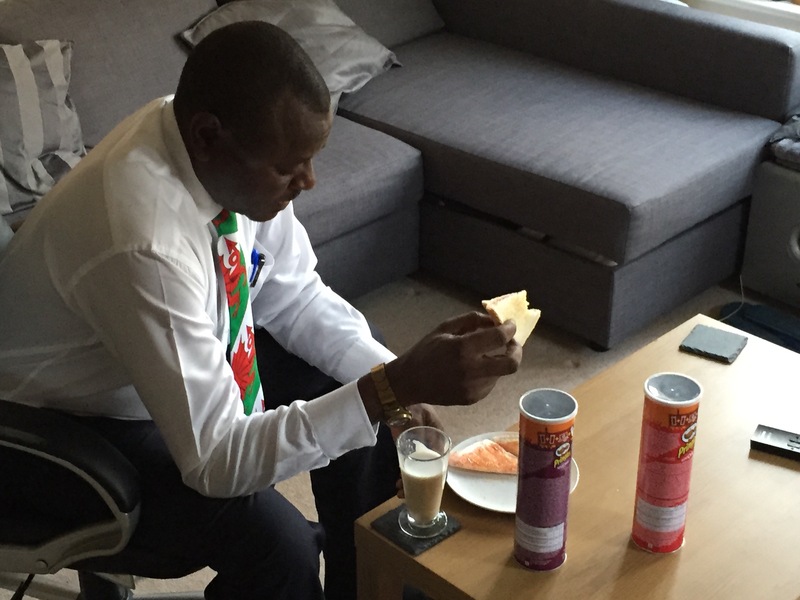 Mr Prewett later dropped Mr Walyaula back to my house, along with a plate of sausage casserole for me! It really was delicious! 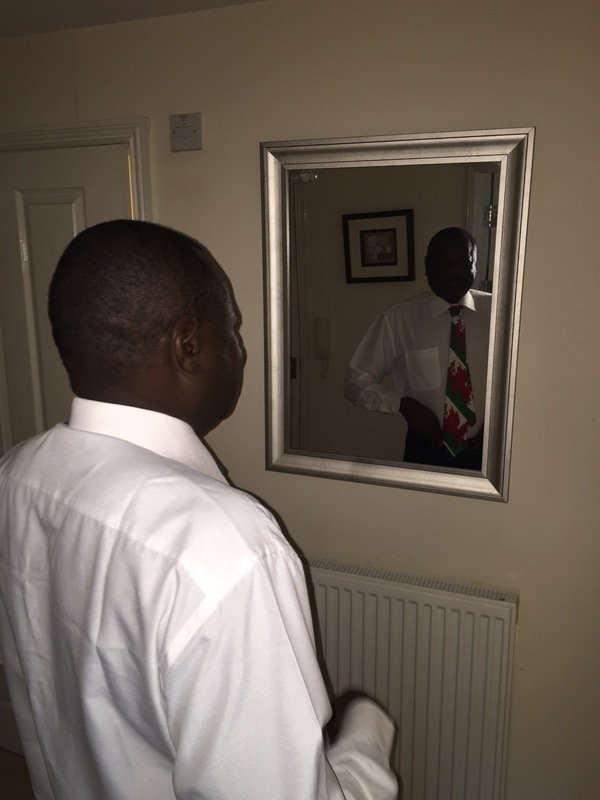 Mr Walyaula was tired, so he ironed his clothes for tomorrow, ate some Haribo sweets and then went to bed.